Mobile devices make it possible to lounge in bed to watch videos and movies. However, imagine if you have a video on your iPad that you want to show off to everyone in the house, rather than huddle together for a glance, put videos on the big screen TV will no doubt be a better alternative. And this is why video streamers come into being. If you're trying to give your TV a smart boost in a cheap way, the Google Chromecast will certainly be of interest. 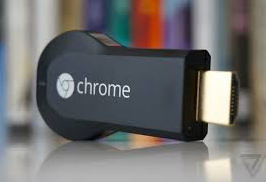 Said on its office site, "Chromecast is a thumb-sized media streaming device that plugs into the HDMI port on your TV. Simply use an Android phone, tablet, iPhone, iPad", which means that you can stream videos, movies and TV shows to Chromecast from YouTube, Netflix and Google Chrome to your TV through Mac, PC, iOs and Android devices. Got a Chromecast recently and I'm having issues with streaming things from a computer. I have tried a few different videos and all of them have had audio/video problems. How can I chromecast AVI, VOB, MKV as my videos are quite different in formats ? I am driving crazy by the incapacity to chromecast MKV videos. Most time there is no audio, or the audio is out of sync and the frame rate isn't very good. The same could happen to many other videos like AVI and FLV. How to chromecast local media with both audio and video? Easy-to-use and convenient as it is, Chromecast is very limited in the input video formats. In other words, chances are that you have stored tons of videos, in formats that are not supported by Chromecast, on your devices and stream video to chromecast for sharing with your family or friends on TV, only to get frustrated at the beginning or result in unsatisfactory results. Here this article introduces a detailed guide on how to play videos on chromecast, more specifically, in supported and unsupported video formats, with a Chromecast video converter. From the above we can see, many popular and widely-used video formats are not in the list of video formats supported by Chromecast, like MKV, AVI, WMV, FLV etc. This means, in view of the few formats compatible with Chromecast, you have to first of all convert your videos with formats not supported by Chromecast. Seems complicated? Not at all in fact. Below a detailed guide on how to stream video to Chromecast, in its supported and unsupported video formats, is introduced. As Chromecast enables users to stream videos, movies and TV shows to TV from PC, Mac, smartphones, tablets and built-in apps like Netflix, YouTube, Pandora, HBO Go, Google Music, Vevo, Plex etc, here we will discuss the methods to stream video to TV respectively. 1.To cast videos to Chromecast from mobile devices like smartphones and tablets, the Chromecast app is essential. Namely, first of all, you have to find and download the Chromecast app and have it installed on your Anroid or iOS devices. 2.Then just launch the Chromecast app on your device and click Cast Screen button. 3.Play the videos you would like to see on your devices, then you can get videos play in full screen. 1. You are also allowed to cast videos to Chromecast through the Chrome brower. Which means you have to install the Google Cast extension for the Chrome browser on your PC or Mac. 2. After downloaded and installed the Chromecast app, drag and drop the video you want to wactch into the Chrome browser. 3. Press the Cast button in the Chrome toolbar of your browser. Once the video is played in Chrome browser, you can send it to TV through Chromecast using the Google cast extension. 1.You can use a smartphone or tablet to watch or listen to content from several sources, including Netflix, YouTube, Pandora, HBO Go, Google Music, Vevo, Plex, Hulu Plus, and Google Movies & TV. 2.In each of those apps, you simply press the "Cast" icon and select your Chromecast, and the video gets sent to your TV. As mentioned earlier, to Chromecast local videos in unsupported formats like MP4, WebM and MKV with incompatible audio or video codecs, or AVI, FLV, WMV, MPG, MOV, OGV, WTV etc, you have to convert those videos into Chromecast compatible ones. Here a Chromecast video converter named MacX Video Converter Pro is suggested. Acting as the Chromecast video converter as well as audio converter, it can easily convert various formats, like MP4, MKV, MOV, M4V, MPG, MXF, MTS, M2TS, M2T, AVI, FLV, VOB, WMV, WTV, DVR, DV, SWF, TS, and etc to Chromecast supported video format and tons of audio file like AMR, AC3, AAC, APE, WMA, WAV, M4A, M4R, CAF, VOC, QCP, MP2, 3GA, and etc to Chromecast compatible audio format. Before you start, make sure you have downloaded this Chromecast video converter for Mac OS in advance. For Windows 10 PC users, you can free download this video converter Chromecast Windows Version to convert videos to Chromecast. Step 1: Launch the Chromecast video converter and click "Add File" button to browse the video you want to convert. 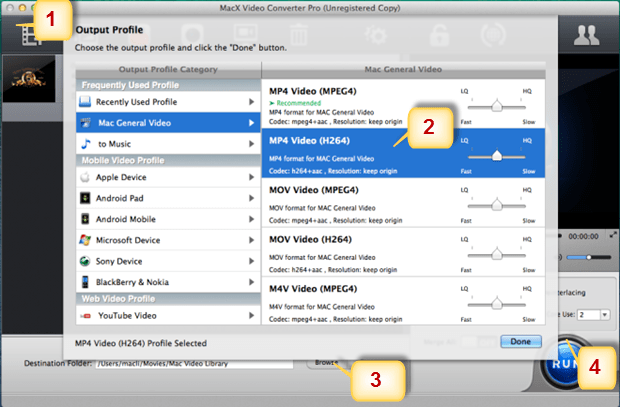 Step 2: Select "MP4 (H.264)" in the output format area. This Mac video converter has configured many profiles for users to convert various formats into Chromecast supported ones, like MKV to MP4, VOB to MP4 and many more. Step 3: Click the "Browse" button to choose the location where you would like to save the converted file. Step 4: Click "RUN" button to begin to convert videos to Chromecast on Mac at fast speed. Then you can Chromecast local media now. You can freely start to Chromecast MKV, AVI, MOV videos etc as you like in this way.